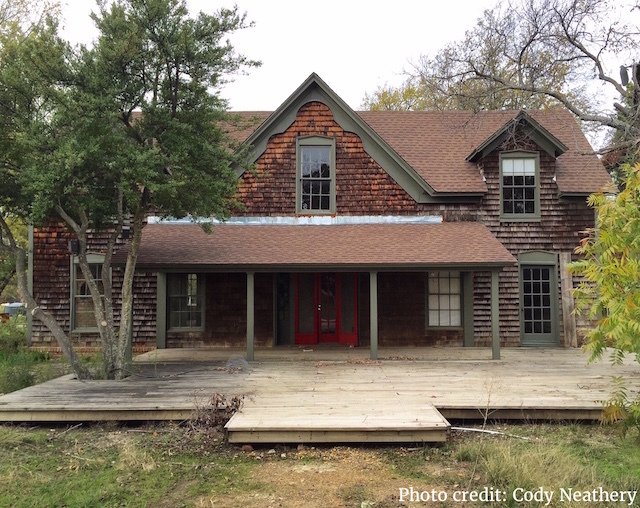 Austin, Texas — Preservation Texas has announced that the Collinwood House, located in Plano, Texas, has been named to its 2016 Most Endangered Places list. The complete list of at-risk historic places will be announced on February 18, 2016 in historic Wooldridge Park in Austin. Preservation Texas is opposed to plans to demolish the house, and is encouraging Texans to rally around the restoration of what is Plano’s oldest historic building. Built about 1861, the house is thought to have been constructed by Julian K. Fox and his brother Charles. It was sold in 1862 to Clinton S. Haggard whose descendants retained ownership until 1936. After a series of owners throughout the rest of the 20th century, the property was acquired by the City of Plano in 2009. The City is planning to use the land on which the Collinwood House stands as Windhaven Meadows Park, and plans to demolish the house. The two-story house is an example of an I-house, a simple rectangular architectural form one-room deep with each room connected to a central hall. The Collinwood House also has a two-story rear projection that results in a T-shaped floor plan When originally constructed, the timber frame was covered with horizontal wood siding which was later covered by the current wood-shake siding. The one-story front porch is a later addition. Inside, wide longleaf pine floors remain, as well as the original staircase. Over time, early interior finishes have been obscured by newer materials or removed, however, enough historic fabric remains to be able to restore the house to an early appearance. Additionally, non-profit-owned historic places are now eligible to participate in the state historic preservation tax credit program, with 25% of the rehabilitation costs potentially eligible for sale to a private entity. “A strong commitment to Plano’s future should not be predicated on the destruction of its irreplaceable cultural heritage,” said Thompson. Preservation Texas is a 501(c)(3) non-profit historic preservation education and advocacy organization based in Austin, Texas. Founded in 1985, Preservation Texas has announced a list of endangered historic places each year since 2004. The organization is funded by the support of its members and donors, and receives no government funding of any kind and is not affiliated with any state or local governmental entity. For more information visit www.PreservationTexas.org or call (512) 472-0102.